Diffusion is the movement of molecules from a region of its higher concentration to a region of its lower concentration. 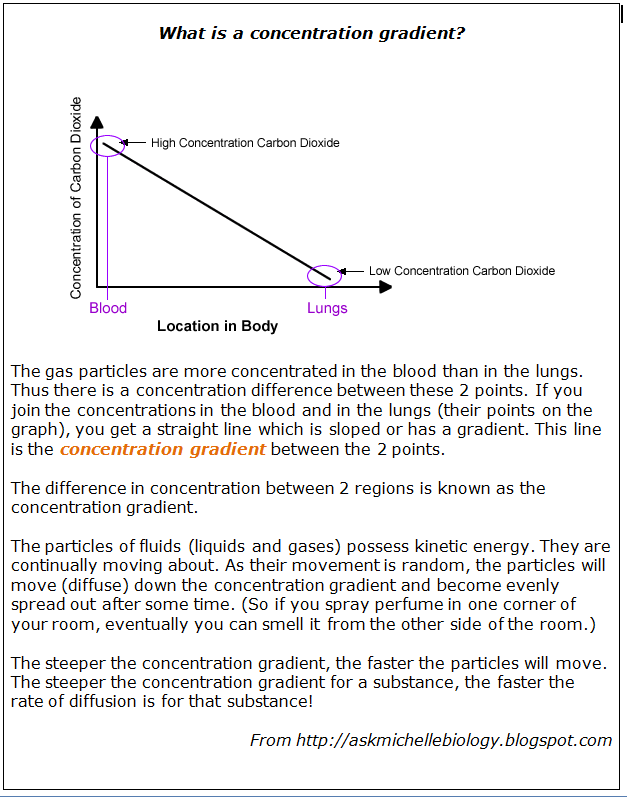 Molecules move down a concentration gradient, as a result of their random movement. 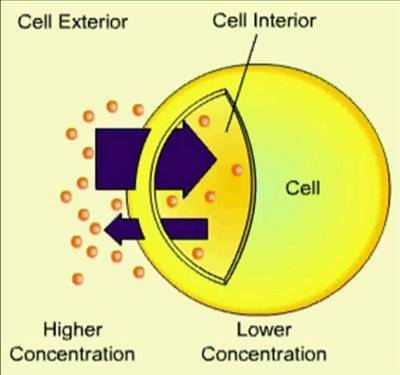 The cell is surrounded by a cell membrane, which can restrict the free movement of the molecules --> This is a selective permeable membrane: the composition of the membrane (lipid and protein) allows some molecules to cross with ease, but others with difficulty or not at all. The simplest sort of selection is based on the size of the molecules. CO2 uses by plants for photosynthesis is diffuses from the air into the leaves, through the stomata (pores at the surface of leaves). There is a lower concentration of CO2 inside the leaf, as the cells are using it up. O2 (waist product of photosynthesis diffuses out in the same way). Flowering plants use diffusion to attract pollinators like bees. Some of the products of digestion are absorbed from the ileum of mammals by diffusion. Gas exchange between alveolar spaces and capillaries. Distance (the shorter the better), e.g. thin walls of alveoli and capillaries. Concentration gradient (the bigger the better). This can be maintained by removing the substance as it passes across the diffusion surface. (Think about oxygenated blood being carried away from the surface of alveoli). Size of the molecules (the smaller the better). Surface area for diffusion (the larger the better). Temperature (molecules have more kinetic energy at higher temperature). Most cells contain about 75% of water. Many substances move around a cell dissolved in water. Many important reactions take place in water.